Brown rice, a very popular food source, can play an important role in your everyday digestion. 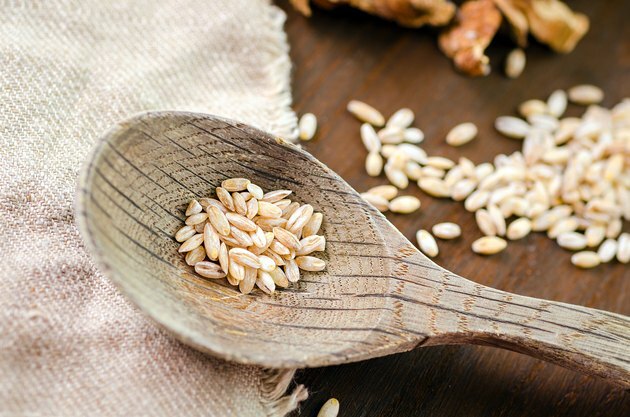 Brown rice is what is known as a fiber, and a diet made up of high levels of fiber comes with numerous benefits, a few of which help improve your digestive system. By increasing the amount of brown rice you ingest every day you can improve your overall health and make your digestive system work more efficiently. Rice has been a popular food source since 2500 B.C. The first rice originated in China but it has since been spread to Sri Lanka, India and the United States. Rice is one of the most important crops to the world today with more than 3.3 billion people depending on it for between 35 and 80 percent of their total food source each year. There are three different varieties of brown rice, long grain, medium grain and short grain. Long grain rice is a fluffy variety that does not stick together. Medium grain rice is a dense sticky version that goes well in puddings and mixed in salads and casseroles. Short grain rice has a very sticky consistency and it is also very soft, making it closer to the traditional Chinese rice varieties. Brown rice is known as insoluble fiber, which means that it is passed through the intestines without changing much. Insoluble fibers like brown rice help move bulk through the intestines more easily and digestion becomes more comfortable. Brown rice also helps remove any present toxins from the digestive system faster. A high-fiber diet can reduce problems with hemorrhoids and constipation significantly. A high-fiber diet doesn’t just aid with digestion, it also functions to improve your cardiovascular health as well as preventing problems with both cancer and diabetes. A high-fiber diet of between 20 and 35 grams of fiber a day can lower your total cholesterol level while dropping the LDL or “bad” cholesterol levels as well. Increased fiber also decreases insulin levels and decreases the risk of getting type II diabetes by 30 percent. With a high-fiber diet your chances of developing colorectal cancer and breast cancer are reduced.